McKenna is not officially a newborn, but she is close enough I thought I would continue the series :). This is age 13-14 weeks old, or the fourteenth week. She also turned 3 months old at the beginning of this week. This week was wonderful, though pretty uneventful. Naps were great, night was great, everything was just great. Things remain the same other than McKenna getting more social. She loves to pull off and chit chat with me and smile. I also had to leave the room one time because she wouldn’t focus and eat–she wanted to find Brayden and Kaitlyn. 4th: unsure. I still wasn’t sure about this length. When figuring out optimal, I work from the top down, so this is my last one to figure out. I went for about 60 minutes, which worked fine, but didn’t necessarily feel perfect. Naps were great. McKenna slept really well. She started taking a longer morning nap. Since her last nap of the day is shorter, I thought it would be good to do a combo 2.5-3.5 hour schedule and let her sleep longer in the morning. McKenna started extending her nights every other night. So one night she would sleep from the dreamfeed until morning waketime and the next night she would make it only about 8 hours, which then required me feeding one side, putting her down, then getting her up a couple of hours later. I am happy with the progress she is making. I have mentioned that McKenna was born three weeks early. Because of that, I like to give her some leeway in my sleep hopes. I have been reading Healthy Sleep Habits, Happy Child, and in it he stresses over and over that your child will meet sleeping milestones at certain ages, and those ages are to be calculated from the due date, not the birth date. I found that very interesting. Most of our outings and events seem to not really affect McKenna because she will sleep pretty well still. I try to get her to sleep at her normal times and for the same duration, which does get harder and harder as they get older. McKenna had her three week pictures this week. We set an appointment, and they took us 30 minutes late for it. This never fails to irritate me! I set an appointment for a reason, and that is so I can be there when my baby is alert and freshly fed. By the time the took us, it was time for her nap. However, she was still cute and smiley and we got some wonderful pictures. We also went to a lake one day this week. We left right after her first feeding. She normally sleeps in the car, but our trip was through a windy canyon. She did not sleep at all. This threw off the day because she did not get her good morning nap (which I try my best to preserve). My husband was great and held her in the sling for her next nap and got a two hour nap out of her. He is much better at keeping her asleep in it than I am. By the end of the day, she was pretty disrupted. The next day was Sunday, which is the disruption of church. Because of that, Monday was disrupted with not ideal naps, but she had bounced back by Tuesday. This was her first Monday that was disrupted after a weekend. Hi! I'm a new mom and my baby girl is 10 weeks. It is really helpful and interesting to see how McKenna is doing just a few weeks ahead of her. As far as naps, my baby sleeps great in the swing right in the living room where all the action is, but it is hard to get her to nap anywhere else! Since yesterday she has had 3 decent naps in the pack n play in a room with darkening shades (I thought this was a small breakthrough). But then, she did not sleep nearly as well last night and ate as if she was starving after a 4-hour night stretch. I'm breastfeeding and just got over my first postpartum period, so I'm thinking that could have something to do with it? Do you think I should be darkening the room for naps or could that confuse her night/day? PLEASE keep making these Newborn Summaries!! My son is the same week as McKenna (he was born March 31st!) I love seeing what you guys are up to! my baby is the same age as yours and i really enjoy reading your summaries. i had a question about naps. my baby, isabella, is on a combo 2.5/3hr schedule and we are having a hard time with a few of our naps. the second nap of the day and she wakes up 45min. exactly everytime. its not a growth spurt/not hungry and she's not too hot or cold or jammed up in her crib. its really messing with the evening schedule b/c then the nap times and eating times collide in the evening, and when she is supposed to be going down for a nap she is scheduled to eat. she ends up taking 2 or 3 catnaps in the evening before bedtime. is this ok? should i work on turning the 45m. naps into an hour or longer? or is it ok that she takes a few catnaps in the evening?i really want to get a schedule down and not just a routine, and our evenings aren't very predictable. what should i do? my baby will be 16 wks next tuesday… he's sort of the same schedule as Mckenna… they are about an hour difference on each feeding though. He's starting to wake up the last 1/2 hour or so of naps and want to play, and he's been eating very well. This weekend we are going to switch him from 3 hour daytime feedings to 4 hours and increase the amount of food, and hopefully, prayerfully cut out the 10 pm dreamfeed… so his last feeding should be 8:00 pm and he should go till 8:00 am… I tried increasing wake times about 4 wks ago, and it totally messed him up, he just wouldn't sleep… i think he was getting overstimulated… but, i'm going to try it again since he keeps waking up early from naps. 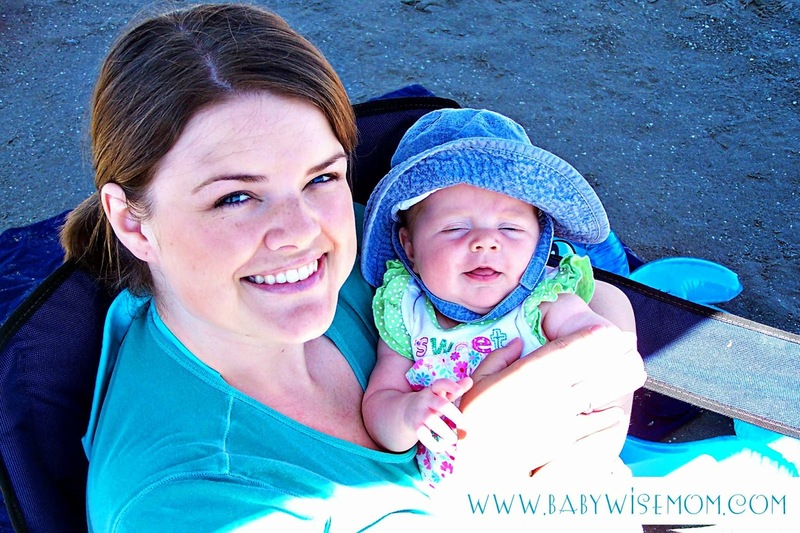 i'd like to keep the same routine eat, waketime nap… he's my first baby, and i can't believe how well babywise has worked, and how much more enjoyable it has made parenting. people comment all the time about how happy my baby is, and i know it's because he is comfortable with his day and well rested. btw, i love this blog, it gives SUCH great tips… i loved the postpartum survival tips you gave on a previous post! those were great! I will keep them coming Rachel! Renee, most likely you are having too long of a waketime. At this age, waketime length is very sensitive–especially the earlier waketim lenghts. Since your first nap is good, keep that waketime length. Be sure you know exactly when she wakes from that first nap and then try different lenghts. If the time is right, she should fall asleep easily and sleep at least 1.5 hours long. Laura,He should still be on a eat, play, sleep routine for most of the day. 7–eat8ish–nap10–eat11ish–nap1–eat2ish–nap4ish–eatNow is when it might vary. Most 4 month olds can drop this nap. Some can't quite. This nap (if he takes one) will likely be 30-60 minutes. He will likely be able to stay awake longer at this time of day before his nap.6:30-7–eat. Get ready for bed and go to bed.10ish–dreamfeedThis is just a sample. Eating times don't have to be exact or straight three hour either. Waketime length will be about 60-80 minutes–varies from child to child. My little guy is 14wks and this is our schedule6:30-7eatnap10nap1:30nap5sometimes short nap8bed by 8:40 or so10:30 dreamfeedtrying to decide what to do for dropping the dreamfeed. I seem to be waking him up for most of his feedings and he doesn't wake up for the dreamfeed, and only eats on one side. I used to feed him at 11 and moved it up to 10:30. what are your thoughts on dropping the dreamfeed? Do I change my schedule at all? or stay with hit and just gradually move the dreamfeed back. Is the STTN based on last evening feeding or the dreamfeed? If i gradually move him back do I do it in 15 or 30 min increments? or just stop doing it? BW is wonderful! He's the best baby and slept through the night faster than my first(BWB also)! Thanks! Eltza, see the blog label "dreamfeed" for lots of details on dropping the dreamfeed.BAsically, I would move it back in 10-15 minute increments until you hit 9:45-10:00. Then I would decrease the amount of time spent nursing. Then drop it all together.You can also do it cold turkey if you prefer. STTN is from the last feeding of the day. So with a dreamfeed, it is from the dreamfeed. Good luck! I am curious about evening/bedtime routines. Our 13-14 week old son has been sleeping pretty well through the night. I've felt our evening routine wasn't quite feeling right for us and have been trying to adjust for a couple of weeks now. I keep going back and forth with different things. His evening feeding is usually around 6:30-7:00pm (I've recently made it later). I would like to have him fed and in bed by 9:00 (he sleeps about ten hours, usually wakes 6:30-7:00am). My concern is Babywise indicates there should be a 5th feed/wake/sleep cycle between these last two feedings. He previous woke/ate at 5:30 and we had a three hour cycle with his feeding, our dinner, bath, massage, then sleep for about 30-45 minutes max. I felt like, not only was everything really rushed but when I finally got him to sleep it was after 8:00 (short nap) and when woke him to eat, he was then too sleepy to get a good feeding. So, I started waking him around 6:30-7:00 and skipping the nap but still feeding him around 8:30-9:00. He starts to get a little fussy but I just take that as a cue "time to eat/sleep." Since I've made this change, our evenings seem nicer but he's started waking in the night. This is much longer than I intended and I'm not really sure exactly what my question is anymore…Just wondering your thoughts. I guess I've just been concerned I'm messing up but not having that 5th cycle. I've noticed in a lot of reader sample schedules, they seem to have cut it out too. By the way…Thank you! This blog is incredible! I know this is a while ago for you now, but I have been following you for years and am so thankful! We just had our 4th, she is 13wo and she has a witching hour. our other babies never had this and i was hoping you would mention when you switched for swing to just putting her to bed, did she have to CIO? How did you know when it wasn't witching hour anymore? We had one night this past week that she went down in her crib from bedtime to dreamfeed,otherwise it is always the swing. Just afraid it is becoming a habit. Do you remember at all? Any insight would be amazing! Thank you!